November 30th, 2010 CCP released Eve Online: Incursion. It was a partially completed expansion. The game mechanics the expansion was named after did not arrive with the expansion. The expansion page for Incursion is one of the most interesting that I have seen as it covers a very large expansion but it is released in several parts over several months. In the Incursion the release is full of what would be considered quality of life improvements. These are small changes to the game that have a large impact on the day to day mechanics the players work with. In the first section of the page the CSM is given credit for bringing several tools and improvements into the game. The release feels light. UI customization has been added. Faction ships are on the market. Visuals have been changed. The war against lag is being fought and the Noctis, a dedicated salvage ship enters the game. But even a quiet expansion can be very loud. The UI changes that started in Incursion created our current HUD. Also at some point there was potential for the neocom to be on the bottom of the screen. I cannot help but think that a lot of people would die if this happened. The changes themselves were not overly loved. The compression meant that players had to learn the new system and the potential of a horizontal bar was not appreciated. I went to the old forums to check. Behind the expansion the attempt to clean Eve of botting and RMT was still going on. A year and a half later, CCP Grimmi released an update that they have not stopped on that path. There are no stats nor any charts such s the first Unholy Rage dev blog. CCP Masterplan also writes an update on the 'thin client' which is part of CCP's continued fight against lag. This particular development blog contains a walk through of how the 'tick' that is Eve's heartbeat works. November rolls into December and CCP releases the Echelon for Christmas of 2010. The Echelon is am exploration ship with bonuses to decryption. The idea is that it would help in some of the incursion sites. What I find interesting is that CCP Loktofeit notes that the Eve universe is 23,000 years in the future. That ties neatly into the rearrangement of Eve's lore which somehow manages to be lost and disorganized. While the Echelon was CCP's official holiday present the real one may be the removal of learning skills. The development blog at the end of November gave a comprehensive overview of the change. CCP Zymurgist followed up with a forum thread giving a detailed Q and A for the removal on December 15th, 2010. This of course led to people being mad. Mad that they would not get a free remap of their attributes. Meh about the skill point reimbursement. Post #49 in the original comment thread makes sure to note that the change is dumbing down Eve and ruining the game with its slippery slope. Post #52 comments that Eve is becoming a game for casuals and post #66 hates the change. January 2011. Eve does not die because of the learning skills being changed. Incursion is being released peace meal. Patch 1.1.0 is released six weeks later and with it comes the actual incursions from Sansha Nation. Incursions will bring a great change to the game in the fact that NPCs will affect daily life, randomly. Where before players did or did not interact with the descent of an incursion on a system a player may be out mining and find themselves in the middle of a great tug of war. This will be stronger throughout low sec and null sec with NPC gatecamps that can destroy roaming fleets and systems locked down for days. At the same time, CCP is releasing its new character creator. This is a major step for one of their longest discussed projects, Incarna and CCP's long worked towards goal of avatar gameplay. Every player will have to log in and create a new portrait. The character creator is receiving a lot of attention. An article on Gamasutra has quotes from the various members of the development team as well as some photographs used for inspiration and hairstyles. New is good but the old has seven years of familiarity and attachment. From this spawns the decision to maintain a database of old character portraits as outlined in this dev blog by CCP Purple Tentacle. http://oldportraits.eveonline.com/ has been created and will be maintained with the images that players logged into for the first seven years of the games existence. Out with the old, in with the new is quite a theme. It covers many changes from character portraits to introducing avatar game play. The changes extend to the forums which are being completely reworked. Eve's community has become an important part of the game and the forum update is not just minor tweaks but a movement to an entirely new forum. CCP expects players to keep up. CPU requirements will also increase. The API is going to HTTPS and gains more customization. Change does not come smoothly. The re-customization process has several hiccups as players adjust to the changes. Incursions are also stumbling along and being readjusted and CCP opens up a feedback discussion with the players to ask them how they feel about the way incursions are working and what should be tweaked now that they are released. To mention feedback, CCP Soundwave posts a development blog outlining responses to player feedback in a new initiative of fixing little things that the players have asked for. This started with some features in Incursion brought forward by the CSM and they want to expand on this. Jump clones can be destroyed remotely now. Remote repairs of criminal players is removed to stop the ability to Concord entire fleets through crimewatch. You can now place items into containers even if the container is not open and you can see the location of stations in the market window. Optimization is a very hot topic at this time. CCP Stillman takes some time to write out how the Quality Assurance process works at CCP. Over in the war on lag department, CCP Veritas explains that missiles break Eve. Missiles are one of the most popular weapon systems and the Drake sits upon a throne as the most used and useful ship in the game. The drake uses missiles and missiles are a massive stress on the server that CCP is trying to correct. During this investigation CCP Veritas realized that the inventory system needed to be cleaned up as well. Compared to CCP's past progress the release of Incursion could be considered messy with fourteen release points to its name. However, CCP Zulu steps in with a Producer's Letter to say that the many point releases is a new model that CCP is moving forward with. This will be the future of releases and he takes the time to write a brief summery of some of what has happened since Incursion's official launch. This post however is CCP's line in the sand to announce that they are about ready to start discussing Incarna, the next release. "We're going to continue on this path of more, smaller and more evenly distributed deployments in the future now that we have the ability to do so and it seemed quite well received by you all. Over the coming weeks and months, our dev teams will add meaningful content and fixes to EVE and we'll be sure to keep you up to speed on all the upcoming face-meltitude that they entail." It is February, 2011. Incursion has been released but it still has a bit more to go. Incarna however is looming on the horizon. CCP first brought this idea forward in 2006 around the time that Eve Online: Red Moon Rising was released. They discussed it at Fanfest in 2008 and showed their concept for Eve's future. They hinted that it would be ready in 2009 but delay after delay hit. 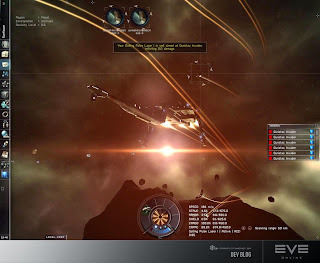 Now, it is February of 2011 and CCP is about to move forward with their biggest and most ambitious update and change to Eve's future with the introduction of Eve Online: Incursion. So I quickly mentioned to Sugar in game that one can see foreshadowing of the Incarna debacle approaching in this post which lead me to ask her whether or not that was intentional. Her, "Well yes and no" answer, as I think about it, pretty much sums up a requirement of historical investigation. Sans laying groundwork as is being done here, the Incarna debacle isn't going to make any sense. At the same time, it can be deceptively easy to wholesale interpret the past through future results lenses which risks shrinking a gloriously rich and detailed past down to only that which comfortably produces the present we now inhabit. 1) Have you considering approaching CCP about what kind of information preservation work they might consider conducting? Given how intriguing this hobby we share is, I, for one, would be pleased if they proceeded with some sense of duty to history. 2) Have you put any thought into how you're going to relate Incarna when it steps into the series? I know I look forward to waxing nostalgic about how the whole bittersweet symphony struck me. The answer to all of your questions is no. This has been a work in progress and develops. I don't really understand what you mean by relate Incarna when it steps into the series. For me, Incarna is the past as much as everything else I have written. I will probably take more time with it and spend more time gathering up the fall out because that too is history. There is a line between the history of Eve's expansions and a history of CCP as a company and the players as a community. I'm not trying to write the authoritative history of Eve online. Because of that, Incarna has been a somewhat unpleasant piece to approach because so many, such as yourself have things to 'wax nostalgic' about and truths and realities about how it went down that I will not be able to do the topic proper credit in most eyes I suspect. For Incarna, I am an outsider. By 'relate' I meant 'give an account of' although, stepping back, I can see how it just as easily reads as 'relate to' which means something different altogether. I appreciate your hesitancy at even approaching Incarna. Given the strong feelings there's a high probability of follow-up yelling no matter how you approach it and that's not something one usually looks forward to. Should you get there (and I hope you eventually do as I really enjoy these expansion history posts) I promise not to yell. In truth I wouldn't have anyway. Though I'm tempted to elaborate on why, I'll save such commenting for the actual Incarna post. I understand that people get upset over things. However, something goads me when exaggeration enters the stratosphere. As for Incarna, discussing it is also hard because it is emotionally charged. It also needs to be laid in the past as what it is instead of used to shake at CCP every time something happens. I'll be regretful if I dredge up more than the topic when I write it out. I came back to Eve in March 2011 after playing a month here or there starting in 2009. Incarna was one of the first things that happened in my "real" Eve career. In my experience, Incarna was kind of like The Phantom Menace... so much build up that the result let everyone down and made folks think, "What the hell were you doing all these years you were teasing about it?!?" Yes. I've tried to foreshadow a bit about it throughout the posts simply because it was such a horrific point for Eve and CCP. Those kernels I am laying out will, hopefully help connect some of the turmoil that will happen. Otherwise it seems as if it is only a single moment.